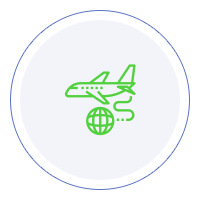 Citizens from all over the world can pay the fee associated with the Dominican Republic Tourist Card online with iVisa. You will receive a confirmation email after applying and the visa will also be delivered by email. The Dominican Republic Government makes the final decision regarding the Tourist Card approval. Our experience of over 4 years and thousands of satisfied customers worldwide is the result of working with the best professionals and latest technology to process the Dominican Tourist Card. 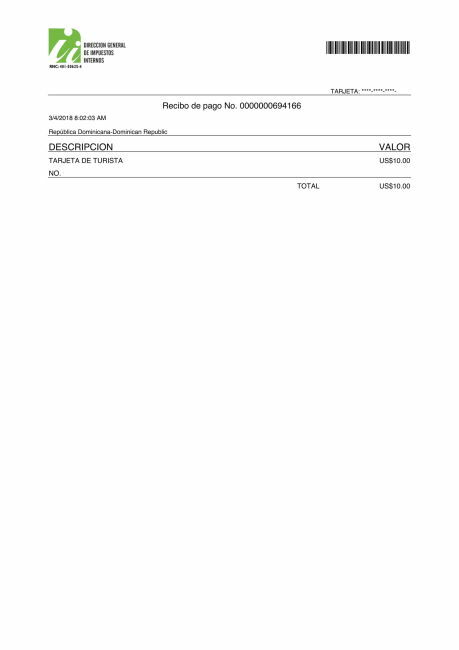 Tourist cards obtained through iVisa.com have the verification from the respective Dominican Authority issuing the document. Our experts are here to solve any doubt. 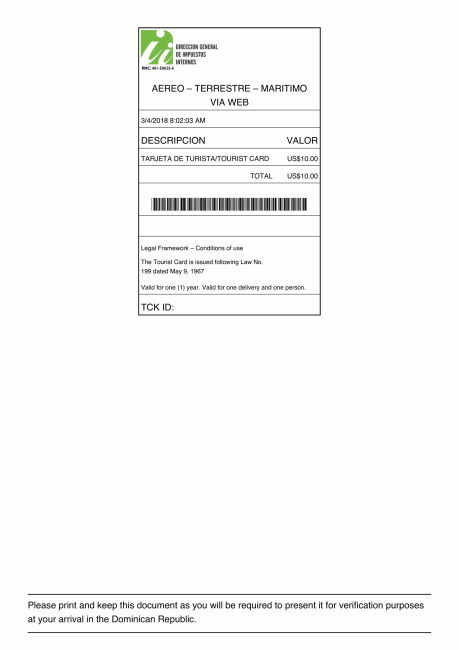 Please note you can easily get this visa at the airport on arrival. We only offer the service because many of our clients have had issues with long lines at the airport to pay for the card and our service will help you avoid the queue. Most of the time getting this card in advance is unnecessary. Starting April 2018, Dominican Republic is incorporating Tourist Card Entry Fee into airfare. The 10 USD tourist card entry fee, normally paid online or upon arrival in the Dominican Republic, will be rolled into your airline ticket. Tourists entering via cruise port will continue to follow the existing entry requirements. If you are a national of a country listed below, you need a Tourist Card, which must be given by the airfare, and a valid passport to enter the Dominican Republic. Passports must be valid for at least twice the length of your stay. Nationals of the following countries do not need either a Tourist Card or a Tourist Visa to enter the country: Argentina, Chile, Ecuador, Israel, Japan, Perú, South Korea and Uruguay. If your country is not listed above, but you are a resident of the United Kingdom or currently hold a valid visa to enter the United States, Canada or any European Union country, you may also enter the Dominican Republic with a Tourist Card and a valid passport. What documents do I need to pay the fee to visit Dominican Republic? How long is the Tourist Card valid? 1 Year from the date of approval. How long can I stay inside Dominican Republic with the Tourist Card? You can stay a max of 30 days. Extensions are possible by paying a fee once inside the country - verify at the border upon arrival. I will travel for business, can I use the Tourist Card to enter Dominican Republic? If you plan to travel to Dominican Republic for business then you need to apply for a visa at a Dominican Republic embassy. How will I get my Dominican Republic Tourist Card? You will receive the Tourist Card visa email so make sure you check your email account after you submitted your application. If you did not receive an email, check your spam folder or contact us via online chat / email us at help@ivisa.com for assistance. Should minors also pay the fee to enter Dominican Republic? Yes, everyone who will enter the Dominican Republic need to pay the fee before their arrival, regardless of age. How many times can I use the Tourist Card/how many entries does it have? If you are stressed from work, and you do not know where to go on vacation, then the Dominican Republic might be what you need to relax a bit. The country is has gained quite the popularity over the last few years, and it is not for nothing. You get to enjoy a lot of things that surely you will love. The white sandy beaches, the good music, and the very welcoming people will help you create some unforgettable memories. Even if the Dominican Republic is a small country, there are a few things that you should know before you go there. There is nothing out of the ordinary, but every little bit of info helps make you a more pleasant vacation. With that being said, take a look at the things that are of interest to you. If you are looking for the best time to go to the Dominican Republic, it depends on what you are looking for. The Dominican Republic has a warm climate all years long, but the most popular time to go there is March through May. Some people seek some warm weather from November to December. However, May through November is the wet season, and May is the worst. It rains all the time, and you could kiss your days on the beach goodbye. As you can imagine, it is not the same all over the country. In some regions, the wet season differs. Even so, make sure that the weather is just how you like it when you take the trip. It is an easy thing to check. When you get there, your heart will warm up right away. The people of the Dominican Republic are very welcoming, and family is very important to them. Friendships as well. They are loyal people who are ready to have a good time in an instant. You will see how families display their affection publicly, and they almost always celebrate something. That is not applicable only within their families. You can join a party if you want. They will welcome you with good food, good music, and an overall amazing atmosphere. As far as people are concerned in the Dominican Republic, you will be impressed. Another thing you will notice in the Dominican Republic is the music. You may have heard about merengue, right? It originates in the Dominican Republic. People put a lot of soul into it, and it creates a positive atmosphere. You cannot resist the urge to dance, and even when you sit down, your feet will have a mind of their own and dance. Bachata also originates in the Dominican Republic, and the only conclusion you can draw from their music is that the people of the Dominican Republic are very passionate about their life. They try to express it as best as they can through their music. As far as money is concerned, there are very few places in the country where you can use US dollars. Even so, you can convert your money in Dominican Pesos. The curious thing about that is that you can do it only within the country. No bank in the world will give you Dominican Pesos. That should not be a problem since you can convert the money back when you leave. Just keep in mind to keep the receipt when you first make the exchange because you can convert back only 30% of the amount you changed initially. One of the best things in the Dominican Republic is that everything is very relaxed there. People there do not mind time as people generally do. They can be late up to 30 minutes without anyone saying anything. However, if you travel for business purposes, it is best if you respect the meeting schedule. One thing that you will notice as you walk on the street, or anywhere else for that matter, is that people are very well dressed. It is like they are trying to impress anyone. In reality, it is just a part of their culture. Even going to church is a reason to wear suits and ties. The only reason you should know this is that you should pack something formal before you travel to the Dominican Republic. You will feel pretty embarrassed if you go to dinner in a nice restaurant only to be the only one wearing Bermudas, a T-shirt, and flip-flops. It may be a beach country, but beachwear is strictly for the beach. Before leaving the Dominican Republic, do not forget to try the mamajuana. If you have never heard about it, it is a potent drink that you will enjoy very much. It is believed that Christopher Columbus himself knew how to prepare it when he came to the Americas in the 15th century. Today, the mamajuana is made of rum, wine, and honey. It is a delicious beverage. Plus, it is said that it has a lot of health benefits, one of which is sexual potency. As for restrictions, there are not many. Of course, you may need a tourist card to travel to the Dominican Republic, but that is an issue easy to fix. As for anything else, you may want to avoid tap water. It is okay to gargle it when you are brushing your teeth, although if you have a sensitive stomach, you should avoid even that. Bottled water is widely available, and the hotel accommodating you may provide a few free bottles per day. Even so, you can find bottled water at every corner store, otherwise known as colmados. The Dominican Republic is a country worth visiting. You will have a lot of fun there, and you can really loosen up a little. Some merengue and some rum (which is excellent, by the way,) will make for a very pleasant evening. If you are open for socializing, the people there will help you create some beautiful memories. You will go home a whole new man. Or woman. It is definitely worth visiting once.